This jewelry set is lacy, delicate, and good for special occasions. Wear the necklace, bracelet, and earrings together or individually. Twisted, beaded chains make this a pattern set for the more adventurous crocheter in you. The pieces are quick to make and fun to wear. They’re sure to capture attention from family and friends! 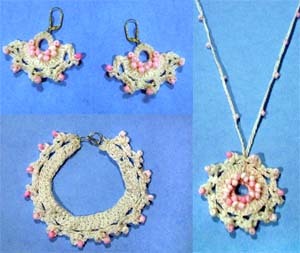 Crochet this set in your favorite thread color and add complimenting beads. This entry was posted on Sunday, July 14th, 2013 at 10:33 AM by Candace	and is filed under Best Crochet Patterns. You can follow any responses to this entry through the RSS 2.0 feed. You can skip to the end and leave a response. Pinging is currently not allowed.